Our featured auction this week is a Deluxe Signed Limited Edition of “An American Life”, personally hand signed by President Ronald Reagan. This book was published by Simon & Schuster and distributed by Easton Press (Leather Bound). Click here to see photos and to bid. 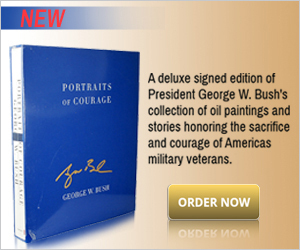 For the advanced collector of signed presidential publications and historical documents. This collectible includes cassette tapes of Ronald Reagan’s addresses and speeches from his 1989 book “Speaking My Mind”. Presented in a handsome publisher’s oak wooden chest with a drawer containing the audio recordings of the speeches. You do not need to be a supporter of Ronald Reagan to enjoy and treasure this stunning, hand-signed, Presidential heirloom. For the presidential historian or serious book collector, Ronald Reagan’s personal signature on his own limited edition work will be a shining jewel in your collection. Very Near Fine. 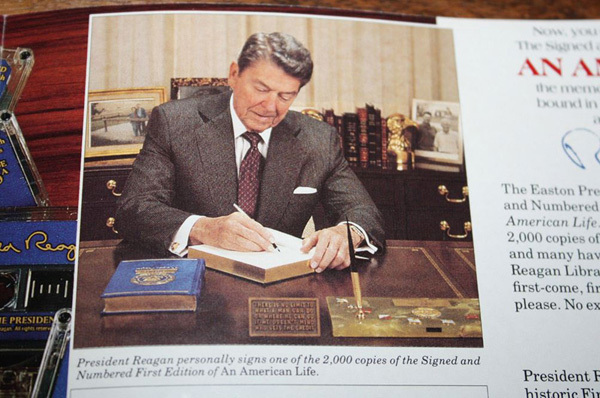 President Reagan personally signs one of the 2,000 copies of the Signed and Numbered First Edition of An American Life.